Buck Jones and Kay Linaker in front of Frank and Hortese Walker's winter cabin in "Black Aces" (Buck Jones Productions for Universal Pictures, 1937). The cabin is located next to the modern-day parking lot for the Placerita Canyon Nature Center. Original colorized 11x14-inch lobby card reads: "The NEW Universal Presents...," probably a nod to the reorganization of the company. Co-founder Carl Laemmle and son Carl Jr. had been pushed out of management positions the year prior, in 1936, for overspending on production to the point that the company couldn't pay its bills and Standard Capital Corp. foreclosed. Under new management, Universal tightened its belt and focused on low-budget oaters like this one. 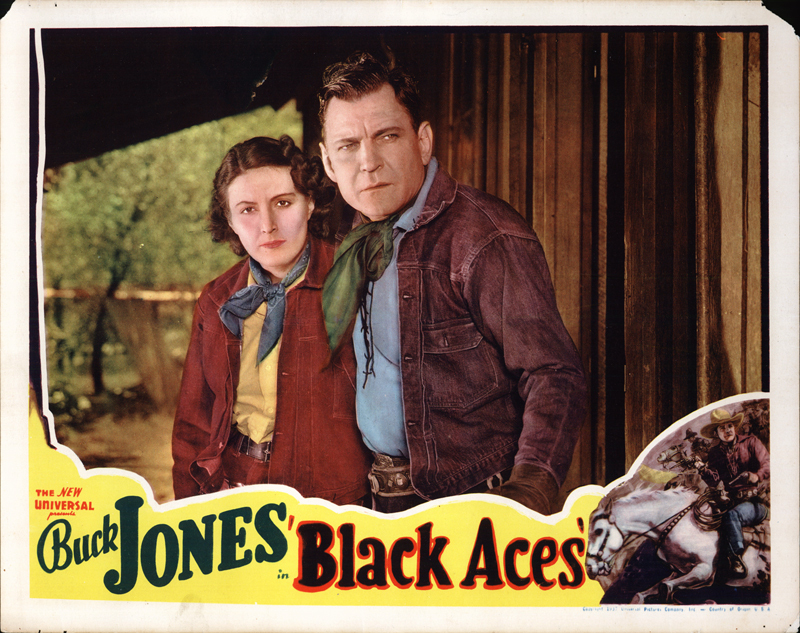 Released Sept. 5, 1937, "Black Aces" is directed by Jones and also stars Linaker, Robert Frazer, Raymond Brown, Fred MacKaye, Bob Kortman, Frank Campeau, Charles King, Ben Corbett, W.E. Lawrence, Charles Le Moyne, Barney Phillips, Arthur Van Slyke and Robert McKenzie. Jones' horse Silver is credited, too, but the following aren't: Herman Hack, Cliff Lyons (stunts), Billy McClain, Bud McClure, Carlyle Moore Jr., Charles Murphy, Archie Ricks, Jack Shannon and Lee Shumway. LW2516: 19200 dpi jpeg from original lobby card purchased 2013 by Leon Worden.